My name is Peter Hadlaw and this was my first summer as an intern with the Globus Online team. I have been around programming, design, and development for over 5 years now. When I return back to school, I'll be finishing up high school as a senior at Maine South HS. 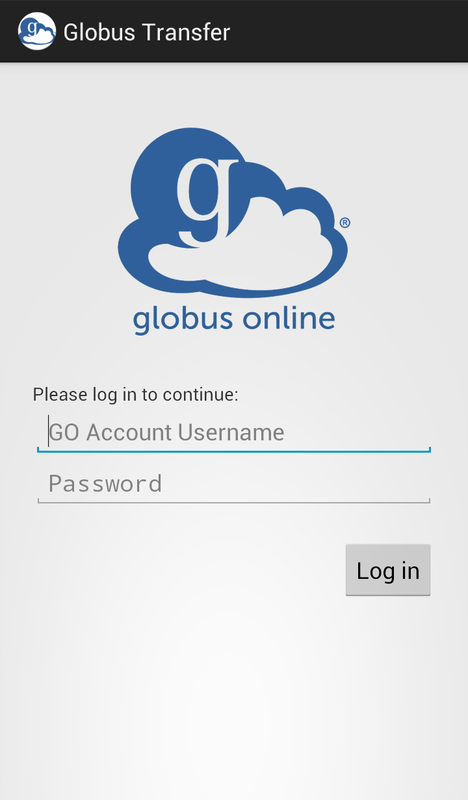 This summer I made an open source Android app for Globus Online. 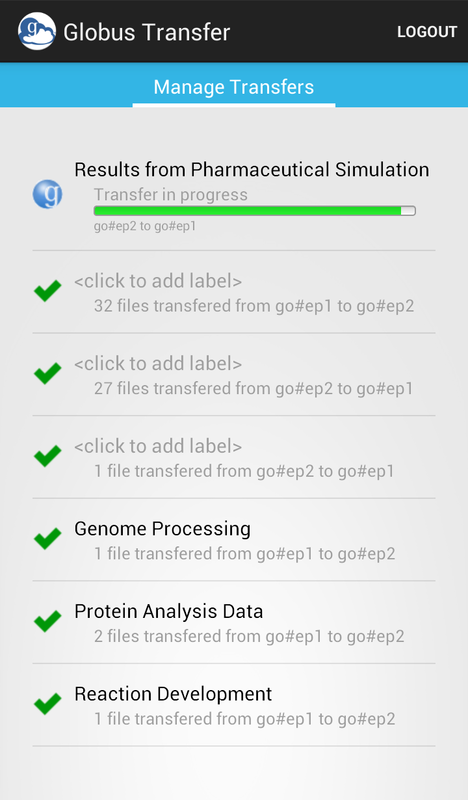 With the "Globus Transfer" Android app you can natively view on your device any current/ in progress tasks and any previously completed tasks that were started on Globus Online. A simple login activity (above) takes you to the main "Manage Transfers" activity (below). In the "Manage Transfers" activity the user will find all of their tasks including any deletes and transfers be they in progress or already complete. For those tasks that are still in progress they will find a progress bar showing the respective amount of completion. If the task has encountered any form of an error or warning, the color of the bar will also reflect that. On this main screen, the user can infinitely scroll down to through all of their previous transfers - all the way back to their very first one. (This infinite scrolling loads tasks incrementally to avoid unnecessary network loads.) If any new tasks are submitted they will automatically appear on this screen due to an automatic refresh feature and any task in progress will also be updated in real time. Clicking on any task in the list will pull up a Task Details modal window (below). In this modal window the user can see a vast number of specific details about the task. The user can change the label of the task, and if the task is in progress, they can also cancel the task to stop it. This is an open source project so I highly encourage you to check out the project on GitHub to contribute ideas and help develop it in any way you can. I definitely had a great time developing this app - not only because I enjoy the challenge, but because the team here at Globus Online is so awesome. I was always excited for the next day. This summer has been great, developing this app was better, but being a part of Globus Online was by far the best! 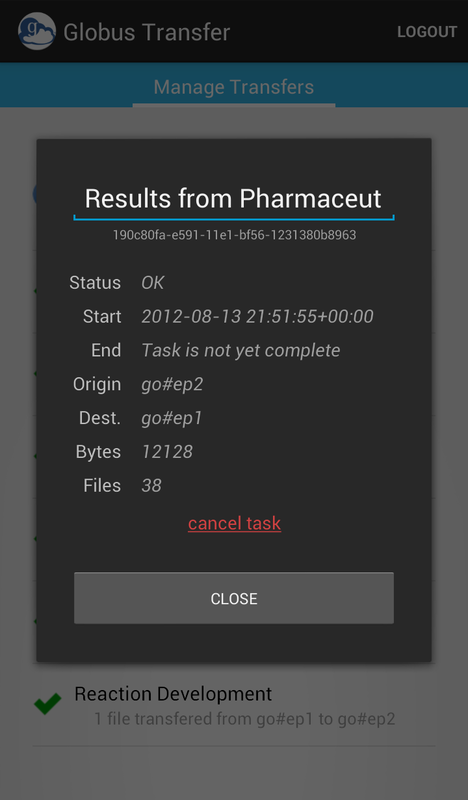 You can download the Android app or browse/contribute to the project on GitHub.